Robin- a little more than a week ago, my good friend Robin called and told me her plan to come to Utah for a few months to complete spring and summer terms at BYU. She asked, if needed, if she could stay here with us. I told her that I was sure we could work something out. But I kind of didn’t think she could actually make all the arrangements and come to an agreement with her ex about the kids, but she DID it. She arrived on Tuesday night, and stayed here until she found a place that would accommodate both her and her bunnies. My kids LOVE her bunnies, but we just can’t have such attractive allergens around here. Women’s Conference- Thursday and Friday I traipsed off to Provo myself to be uplifted and spiritually filled with many great talks. I wish I could remember every great word I heard. I wrote so much down, and have many things in my life to examine and hopefully make better. It was really great. By Friday afternoon, though, I couldn’t sit through one more talk, so I was happy to leave campus with Robing to go look at an apartment. That one didn’t work out, but she found a great one on Saturday. Cole’s trip- Wednesday evening, I took Cole, two of his friends and one of his advisers to the airport, so they could all fly down to New Mexico for the Academic Decathlon Nationals. They have been studying SO hard and SO long, and were ALL glad that the weekend of the competition was finally here. I got a few texts about how things were going, and Ryan watched a bit of the superquiz that was streaming live on Friday afternoon. For their first time ever at Nationals, they didn’t do too badly. 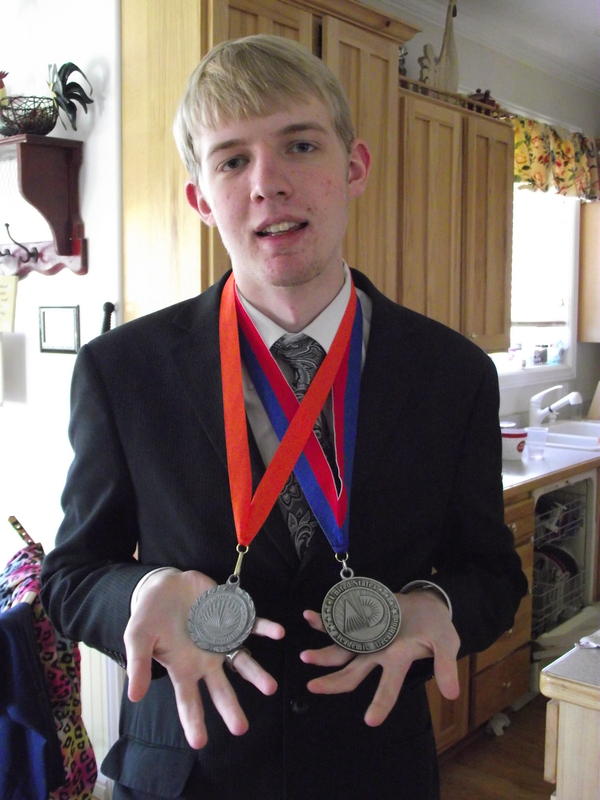 Cole earned a Silver medal in speech, and we’re so proud of him. I have no idea how much money he owes from his trip, as they haven’t finished their fundraising, but if any of you would still like to contribute, Cole takes checks. He came home Saturday night, and we were thrilled to hear all about it. You can read his take on it at his blog here. 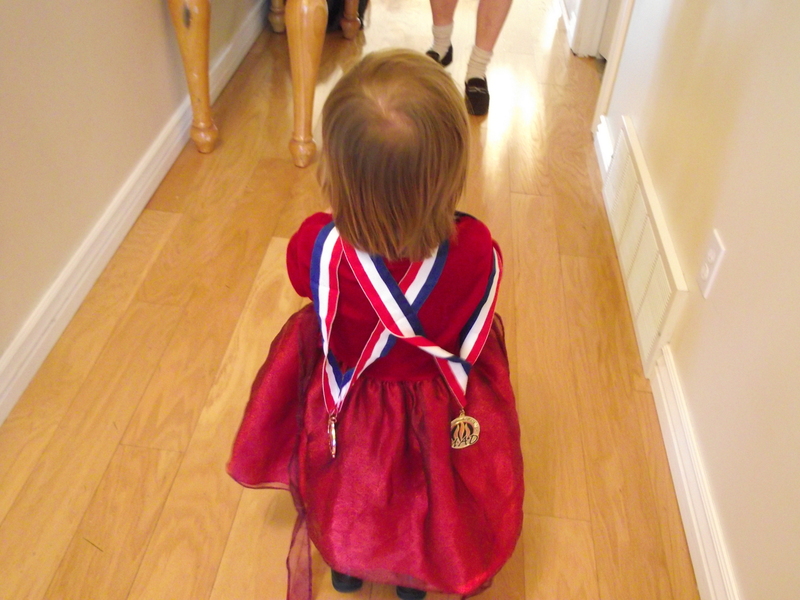 Here’s my niece wearing some of Cole’s medals. 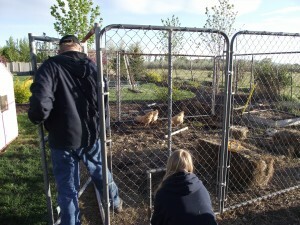 Chicken enclosure- For a while, now, I’ve been trying to figure out the best configuration of dog runs and coops for our chickens. 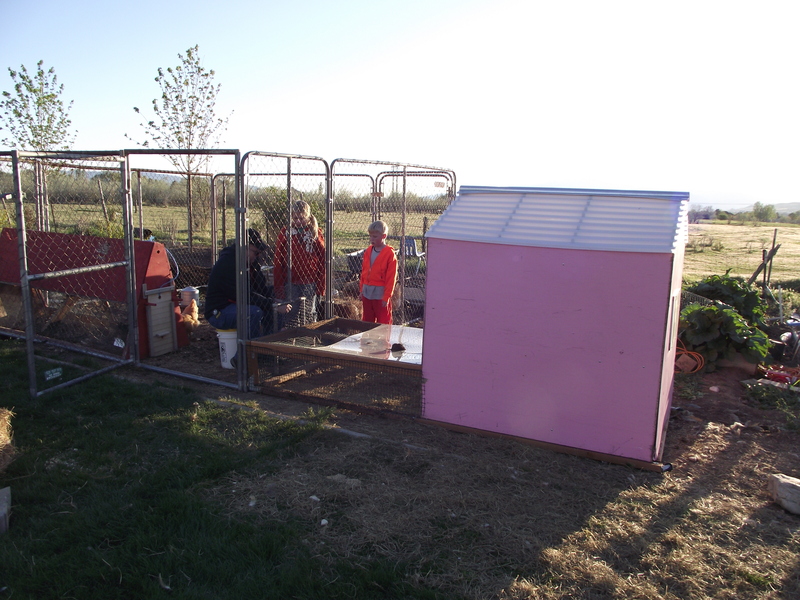 Well, Saturday we took two separate 10′ x 4′ dog runs (both acquired for FREE, I am proud to tell you) and made one 14′ x 14′ enclosure. It took almost all of us to get everything moved. One chicken coop in enclosed within the fence, and another is attached to the side. 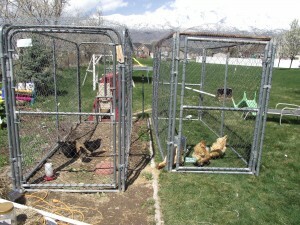 So I can let the chickens out, and they will hopefully have enough space to not pick on each other. 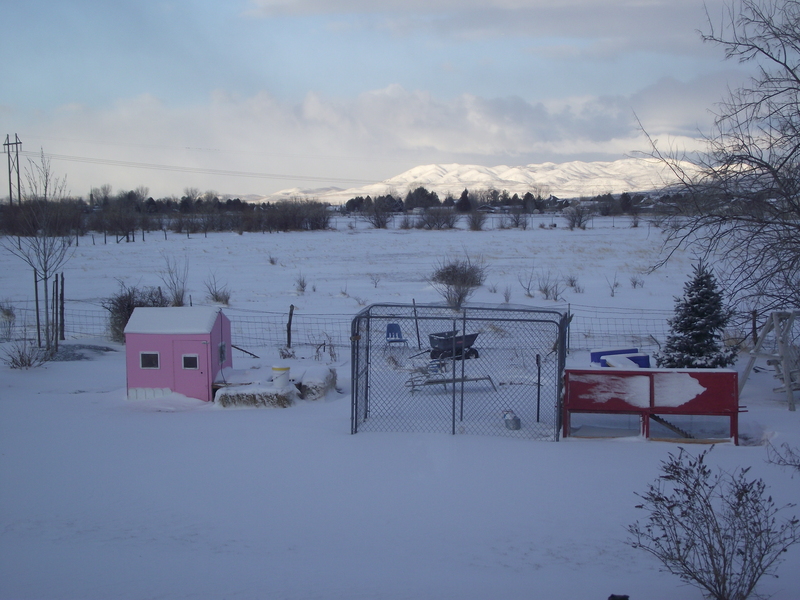 I am not quite to the point of just letting them all roam with no chaperone, there is no cover over the run, and we have lost chickens when they were scared and flew up and over the fence, so we really need to get that covered. We’ll work on that this week. Mom’s birthday-Saturday was my mom’s birthday, so I invited the whole family over for dinner on Sunday. I think we had 32 people over here, and they created quite a cacophony of noise! It wasn’t quite warm enough for everyone to go and eat outside, even though we had worked to get plenty of outdoor seating ready. I did eat my dinner outside and it was so much more peaceful than the chaos inside. But I think my mom appreciated having everyone together, yet not having to have the party at her house. My sister’s little boy started having an allergic reaction to the birds (who live in the corner of the kitchen), so that wasn’t fun. 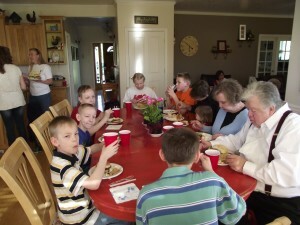 I was just so impressed that they had come, and brought all 13 kids. Yes, I mentioned that it was crazy, right? Between me and my sisters, we have 22 kids. 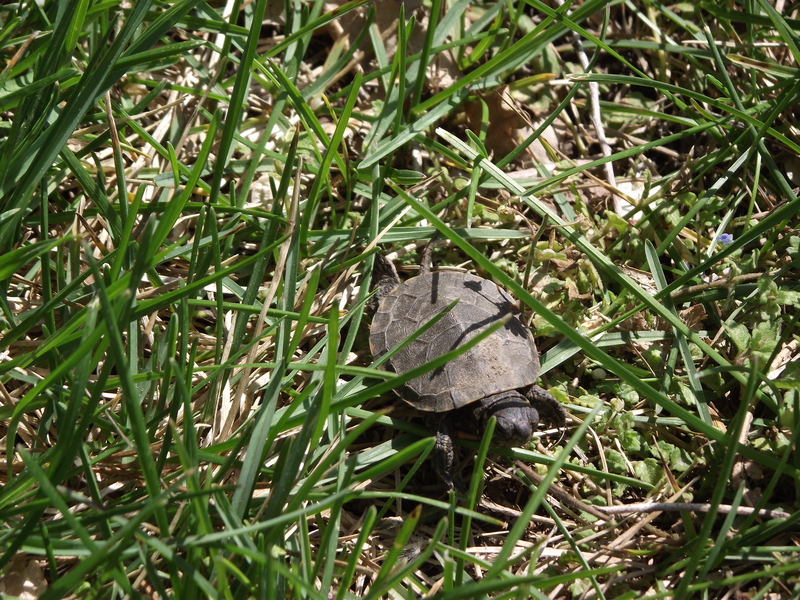 I was outside trying to make sure none of them wandered off. I will admit that I didn’t totally clean up after everyone left. Our family just settled in to watch the Amazing Race (so sad that Mark and Bopper were eliminated) and I put it off until the morning. Messes will ALWAYS wait for you, I have found. It was quite a week, and a wild weekend. I am personally very thankful for a boring Monday when I can get a little caught up. Well, until the kids get home from school, that is. Then I need to find a tux for Cole, take the kids to piano lessons, help with homework, make dinner, have family home evening…. She very calmly and patiently asked if this was the Erickson residence, and said that she had gotten a call, and was there an emergency? 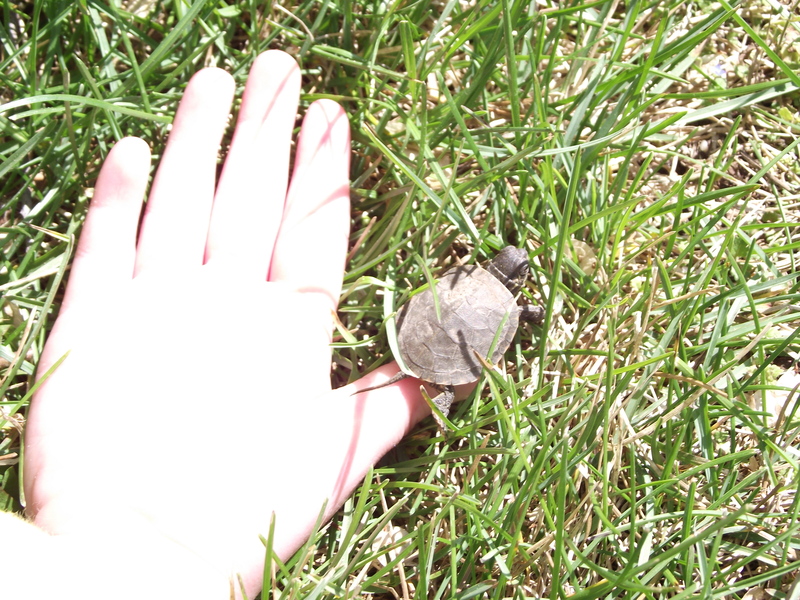 She sounded kind of like my neighbor. Was this a joke? I fumbled around saying that I don’t think anyone called 9-1-1, but I would have to check. I was still kind of wondering if this was a dream. I said I would check things out. “I will send a patrol car over,” she said. By now Ryan’s up, too. He said he had just barely gone to bed, and he didn’t call. So, we made the rounds. I woke up our poor houseguest Robin, asked her if she had been using the phone, checked on each of the kids, and they were all in their beds, and Ryan checked the phones. By now I was awake, and thinking this out. How on earth did they get a call from us? Could it have come from one of the kids’ cell phones? If it had, why would they call the home phone? I climbed back in bed, and then there was a knock on the door. Oh, yeah, the patrol car. I look out the window, and sure enough, there’s a police car outside. We dashed downstairs, and open the door to the police in our pajamas. “We got a 9-1-1 from this number. Is everything ok?” Said the nice officer. We then explained our befuddlement at who had called, and thanked them for coming out and said it looked like everyone was safe. They left. I checked on all the kids again. Really made sure they were breathing. How in the world was I going to go back to sleep after this? I’m such a worrier at night as it is, and this wasn’t helping. Ryan and I said a prayer, and then we ‘went back’ to sleep. Or, Ryan went to sleep and I obsessed about every sound I heard. The ‘whatifs’ finally subsided, and I don’t remember much after 4, so I must have fallen asleep. The 6:20 alarm was harsh, I tell you. So, it is officially a mystery. But things are fine. The house is fine. The foster bunnies are ok. 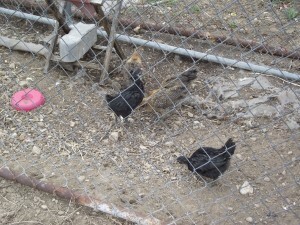 The chickens are ok. Everything seems to be in order. Maybe I dreamed it all. Except if I did, why would Ryan had had the same dream? Oh, well, it’ll be a funny story we can laugh about. As I was walking out of church on Sunday, I took my sunglasses out of my bag and put them on. In doing this, the frame cracked and one of the lenses fell to the ground. What the heck? Those glasses aren’t even that old! As a fair skinned person of the blue eyed persuasion, I do not leave the house without sunglasses. I keep a pair in my purse, a pair in the car, and I have multiple pairs of glasses at home. I buy them whenever I can find them on sale. Kohl’s often has sunglasses on clearance, so when I can find them for $5 or less, I will buy a few pairs. I do not buy expensive, fancy, designer sunglasses. What would be the point? I would just scratch, break or lose them within two months, and then I would be out $30-$50 bucks instead of $5-$10. Although if you wanted to send me some really nice shades, I would promise to do my best to take care of them. Irritated with my dumb glasses and wondering if I could somehow fix them and make them wearable again, I put them on anyway. My kids thought that was the FUNNIEST thing ever, and that I was wearing them merely to entertain them. Right. I wore them home. 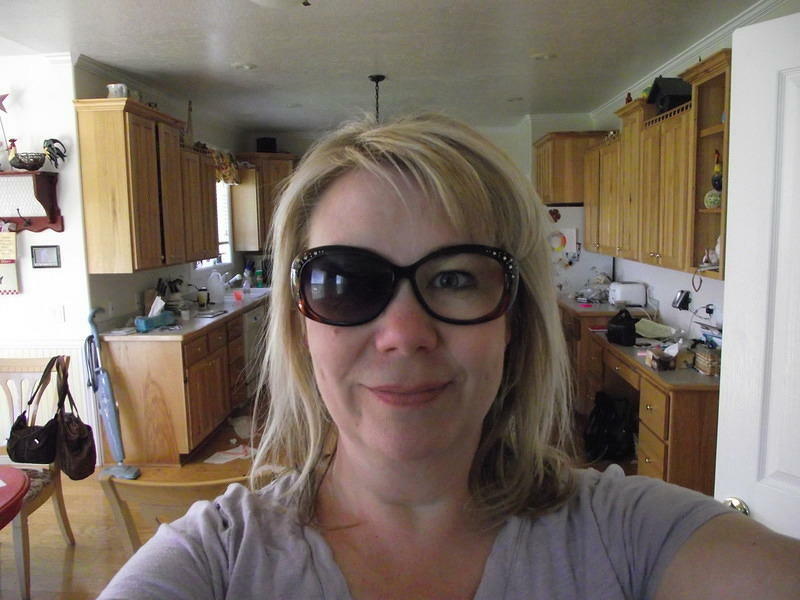 Because otherwise I would squinting like a…like a something that squints. The kids roared with laughter all the way home. I wore the glasses inside. 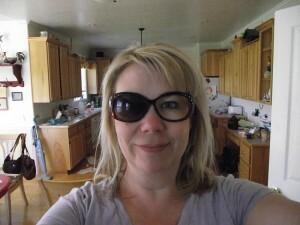 Busting up with laughter, the kids said it looked more like I was a pirate wearing an eye patch. They even HAD to tell Dad all about it when he got home later that day. Ha, Ha, very funny. So I resigned myself to giving these ones up and wearing my next back-up pair. Linking up to Alphabee Thursday. On Easter I was released from my church calling in the primary presidency. We had been in there together for almost 2 years, and it was time for a change. Our president is dealing with a lot of stuff in her family right now, and she needs to focus on them right now. Since they let her go, they had to cut us all loose. I am sad to leave that job, as I really do love working with the kids. What I won’t miss is trying to keep our primary staffed. It was a constant struggle, with people moving in and out and being called to different jobs, to keep teachers for every job. And now I don’t have to worry about it. I’ve been two weeks without a ward calling, and I like it. Most people don’t remember or even think about that my Bells on Temple Square job is a church calling. And it’s supposed to be my MAIN, if not my only calling. I do spend an average of 6 hours a week on that calling, between travel and rehearsal time. So I’m ok if they don’t reassign me to something right away. Sunday was my first time being at church and not going to primary. Did I enjoy the lessons in Relief Society and Sunday School? No, actually, I did not. Since Ryan was out of town, I had told one of the other nursery leaders that I would go in there and help. Well, she called and told me she would be out of town, but we could handle it with just the two of us. Little did I know, they would call the main nursery lady to a job in primary. And didn’t call anyone else. So, one was released, and two were out of town. Hmmm. I grabbed Andrea, our former primary president, and asked if she would hang out in the nursery with me. What fun! Two subs muddling through. One poor sweetie broke out in tears when someone left and shut the door. I held her until her sobbing turned to shudders, and she fell asleep. 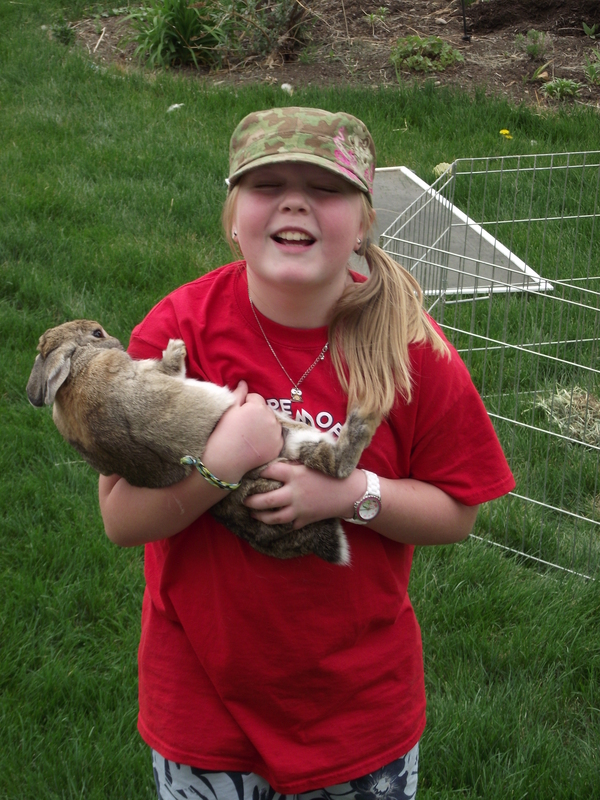 I eventually handed her off to one of the slacker elder’s quorum members who come into nursery to …..help? NO. to avoid going to class is more like it. 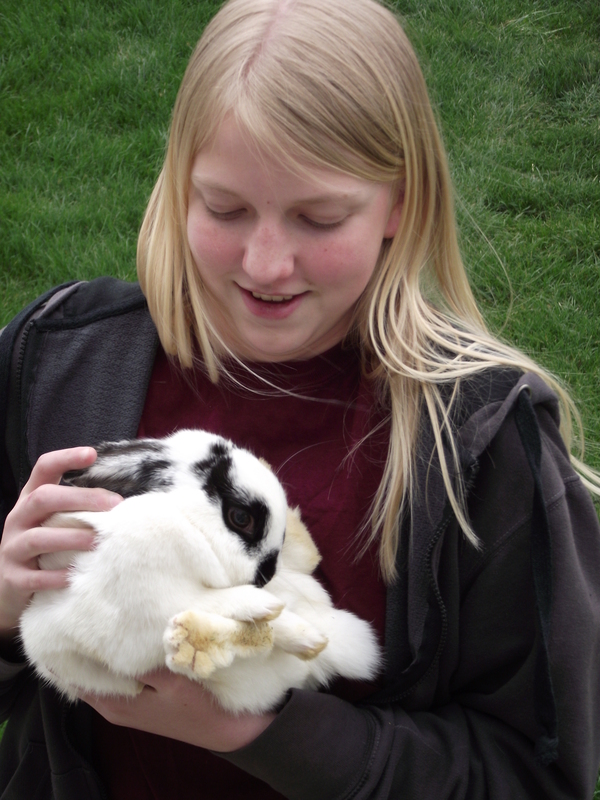 He held her for a while, while I fed them all snacks. We had no singing time (someone swiped their cd player), no lesson, and no structure. Go with the flow of nursery, that’s what Ryan always does. I made the rookie mistake of getting a band-aid for one of the little girls who claimed she had an OWIE. Wouldn’t you just know it? Now EVERYONE has owies, and they ALL need band-aids. Sorry, kids. I’ll just kiss yours all better. It was fun. I can see why Ryan and his nursery buddies love it so much. Is the HOKEYEST movie I have seen in quite some time. I rate it better than Ponyo, but worse than Rango, if that tells you anything. I did enjoy watching ‘Peta’ in a different setting, but that was about it’s only redeeming quality. I kept expecting Vanessa Hudgins to break into song about how much she missed Troy. But it was a fun activity for the kids and I to go to on a hot Saturday afternoon. Especially at the end of a long week with dad out of town. 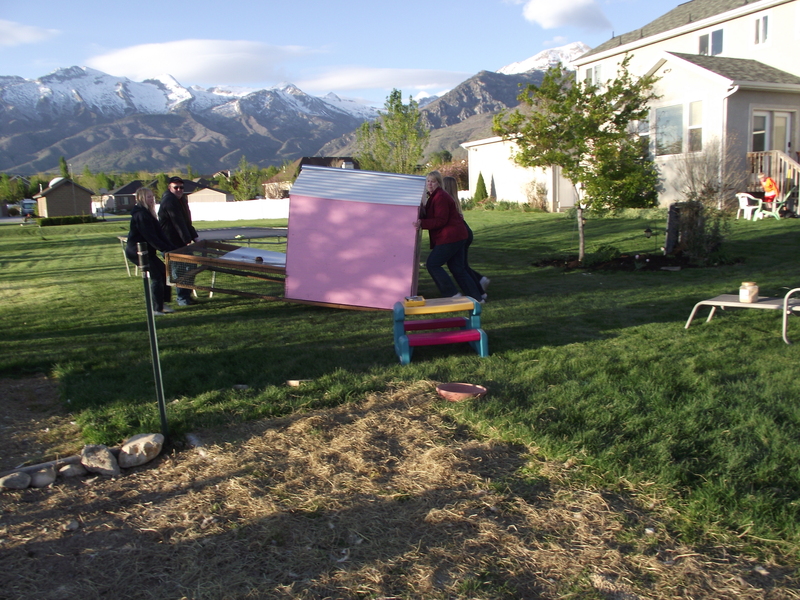 We had already had our fill of the sun with soccer games, garage sales, and working in the yard, so many of us were sunburned, and the dollar movie (or sticky shoe, as we lovingly call it) seemed a good option. But even my kids were laughing at how totally over the top and improbably it was. And speaking of heat, Ryan made it home from India. His pictures look like what you would see on the Amazing Race. And what a coincidence, the Amazing Race WAS in India last night. He was in Bangalore and then flew to Delhi. His thoughts? Crowded and crazy. But he did see lots of cows, and even went to a National Park mini safari thing. He should blog about it! I’m trying to get myself out of vacation mode, after our trip last week. But there are so many things I want to remember, so I keep writing about it. Of course if the pile of laundry takes longer to get through than the actual vacation, you know you are in trouble. *We come from Pioneer ancestry, and those pioneers were amazing people. They worked hard, were inventive and industrious people. They also sacrificed much and left their homes, even, to protect their religious freedoms. *Grandma and Grandpa love them very much. They would have to, to come on vacation and spend 8 days with us. They even love them enough to let two of them sleep in their hotel room, if needed. Now that’s love! *Joseph Smith was not only a great man, a dynamic leader, generous and loving, he was also a prophet of God. *You don’t have to have fabulous adventures to have something to say. Mark Twain wrote about his own hometown. *It took courage, skill, ingenuity and determination to build the St. Louis arch. And in the building process, not a single man died. What they will probably remember..
-Mom let us swim in every hotel pool. -That arch is REALLY high, and it was cool to go up and take pictures. -Playing cards in the airport. But whatever they remember or don’t remember, I hope they remember all the fun times and laughter we shared on our trip to Nauvoo, Hannibal, and St. Louis in 2012. Linking to Jenny Matlock’s Alphabe Thursday. Remember those chicks that we got back before Valentine’s day? 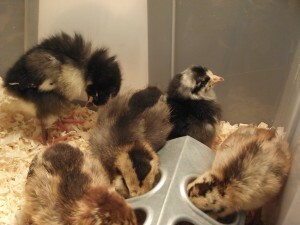 They looked like this when we got them. Soon they were to that awkward teenage phase and looked all gawky, but in a cute kind of way. 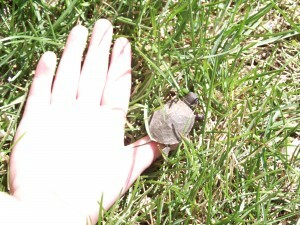 When they were about a month old, we started to take them outside for outings. We had to move them from the basement to the garage, because they were oh-so-smelly. Even then we had to change the paper in their box every single day, or we couldn’t stand the smell. They seemed to be more and more chicken like every day. 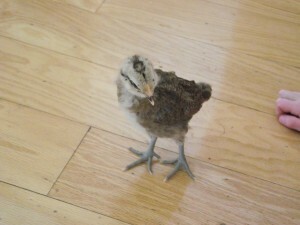 Although this little girl looks very hawk like, doesn’t she? 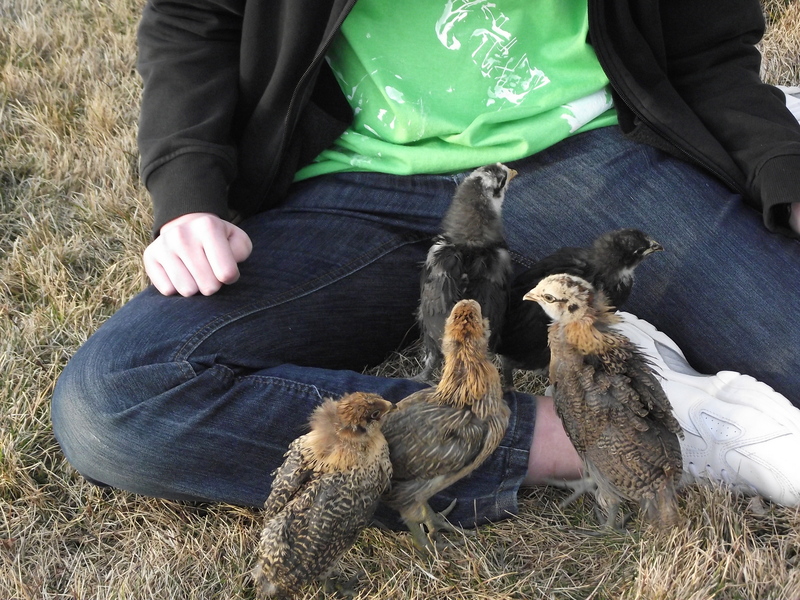 Once they were about 6 weeks old, I started taking them outside and letting them stay in the outside coop during the day. 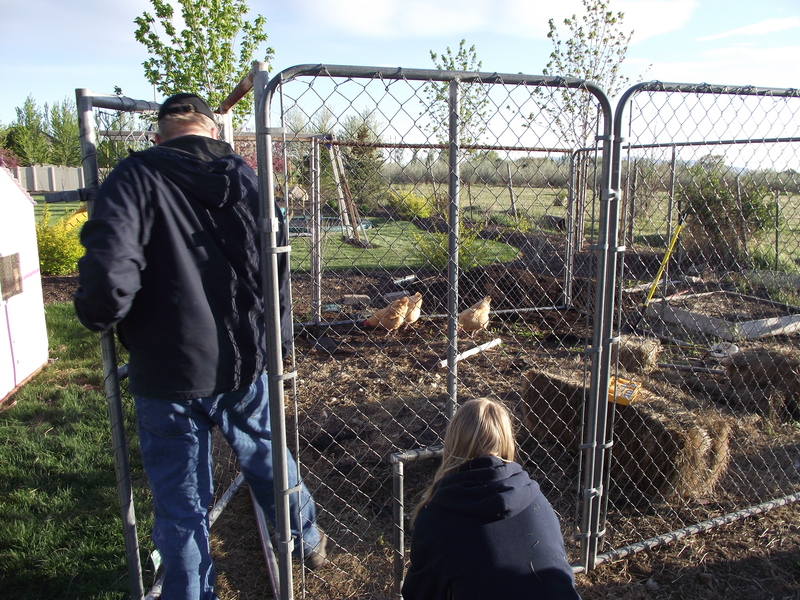 But then I had to put the bigger chickens in a different pen to keep them from picking on the mini chickens. So that involved me carrying all the little chickens outside to the coop, moving the big girls to the run, etc. Then if it got too cold, I had to move everyone back. Spoiled much? Yes. They are. 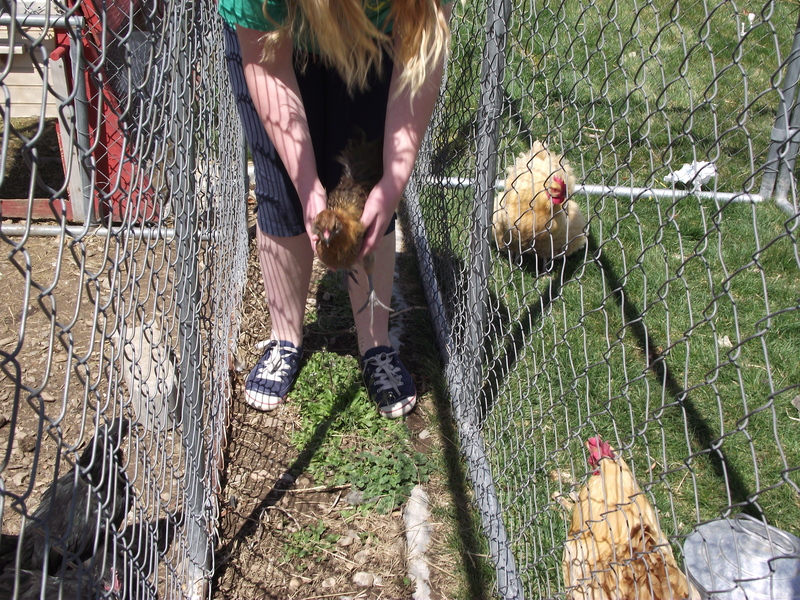 When we went on vacation, I spent a good deal of time worrying about the best way to house all of my chickens. 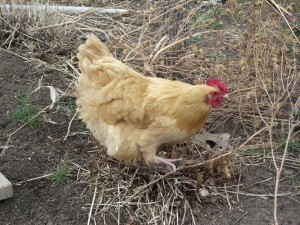 If I move the big chickens out of their pink coop, then they could use the old crappy red coop with the attached run. 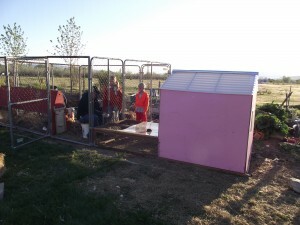 The pink coop is a little bit more protected and should be warmer, so I could put the little chicks in there. But what if it snowed? 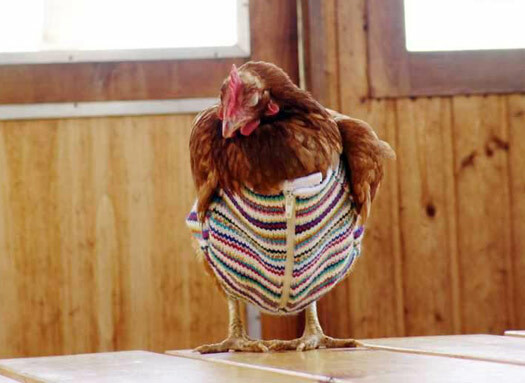 Would the little chicks be warm enough? 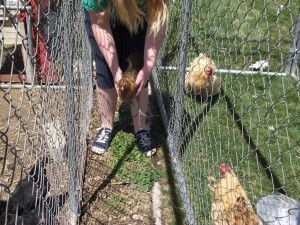 I realized this is the first time I would be leaving my chickens, since we got chickens! 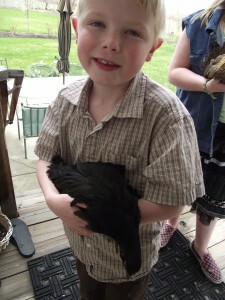 Our last family vacation was last year before we started our great chicken project. I really don’t think I’m supposed to spend this much time and energy worrying about my little feathered friends. We did get everyone settled, although I didn’t know if my girls would lay in this other coop. 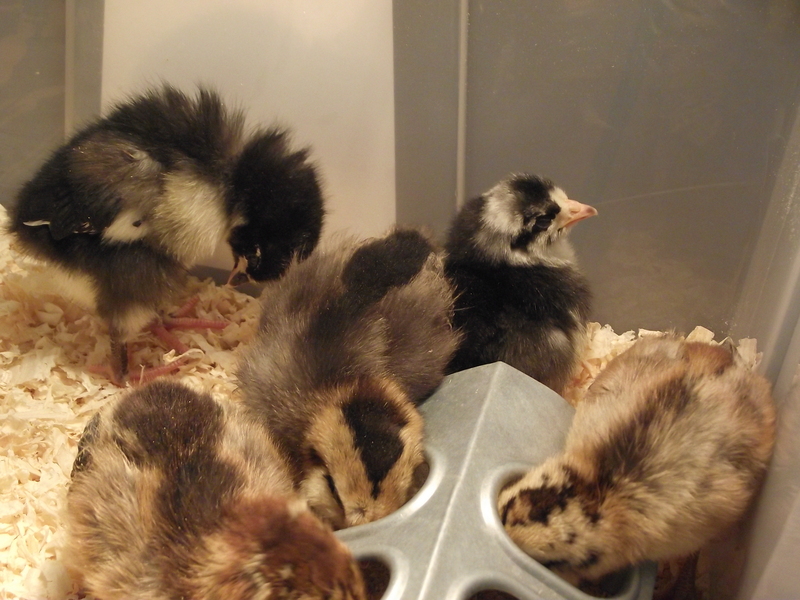 They really like to lay their eggs in their OWN box in their OWN coop. Even if I moved their lay box into the other run, they wouldn’t go in there, and if they did lay an egg, I would just find it on the ground. Ugh. Well, we DID leave them, and they made it through. Well, most of them did. We came home to find one of the little Americaunas dead in the coop. Not sure what happened because we had a girl coming to feed and water them, and they were apparently all ok the afternoon before our return. 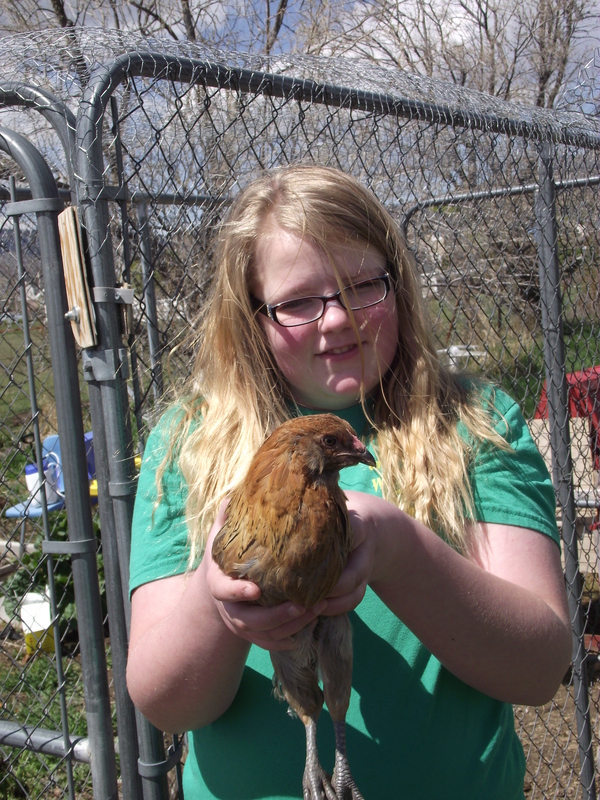 We are sad to have lost one, but I am trying to teach the kids (and myself) that these things happen with chickens, and we should be happy that four of the mini chickens and all the big girls made it. 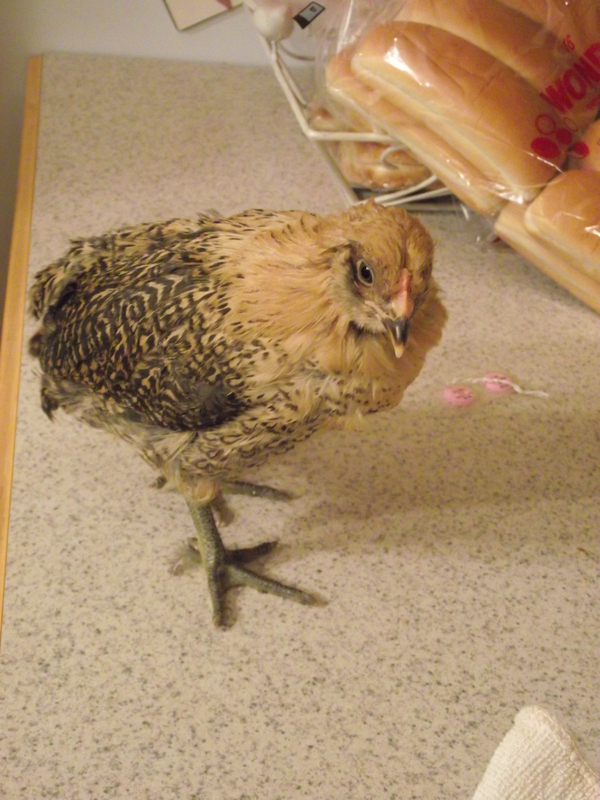 Now my job is to acclimate the two sets of chickens. They have two side by side runs that I can put them in during the day, but I still worry about putting them all together. Look how big they are getting! Almost like real chickens! And they are starting to sound more chickenlike and less like cheeping chicks, too. The kids love them, and so do I. Even my husband, who a year ago was anti-chicken, has said how much he likes having them. 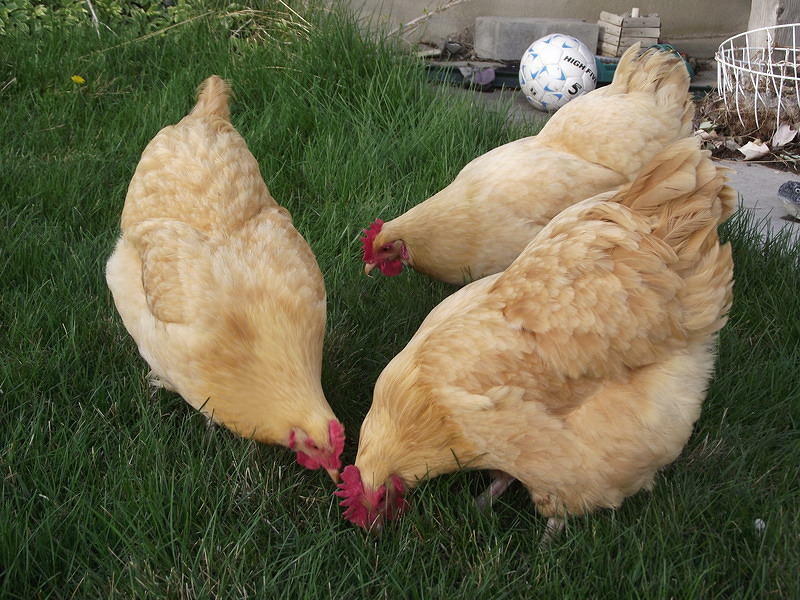 Hopefully within the next few weeks we can get things settled, and no more separatism between chickens. 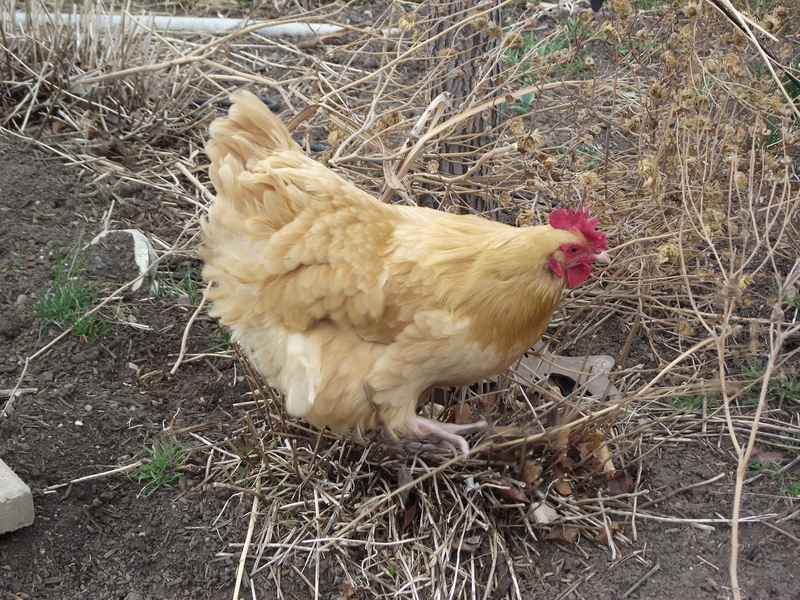 And we’ll settle into a summer routine and get back into our egg laying. Yes, we love our chickens. And I’m not dressing them up in chicken clothes. Not yet, at least. We had the opportunity to attend the temple while in Nauvoo. The temple, so long a symbol of pioneer sacrifice and heartache, is now rebuilt and beautiful. I don’t know how the placement of the rooms compares with the original temple, but it is breathtaking. 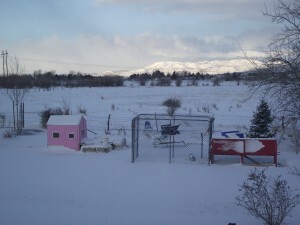 Because three of my kids were over twelve, they were able to go inside. The adults went upstairs to do a session. We rented our temple clothing there. It was a busy day, with a stake from Peoria there that day. But they did manage to get everyone in to the scheduled session (you have to call ahead and make an appointment. No walk ins here.) There was a little bit of a mix-up with my temple packet I had to ask for help..twice! But that’s enough about that. It really is best to bring your own temple clothes, I guess. I’m glad that we were able to work temple service into our vacation. It was a really special experience to be there with my parents and my kids, all going to the temple together. The kids finished first, so they walked the four blocks back to our motel. Special memories that I hope they will treasure. I must admit that I haven’t really given the St. Louis Arch much thought. I have been to St. Louis before, but it was always a passing through. We would fly in, then drive to our house in Illinois. We had also gone to the LDS Temple in St. Louis, but since we had a babysitter with the little ones at home, we didn’t stay around to sight see. Until this week, when we stayed two nights in St. Louis. We followed the GPS downtown, although it sent us through the streets on a confusing goose chase. Come on, GPS. But, since it happened to be the opening day of baseball season for the St. Louis Cardinals (did you realize they won the world series last year? They Did! ), we got to see some of the celebratory parade and carnival, as well as the stadium. We finally made it to the parking lot and walked over to the arch. It was just beginning to rain. We should have taken more pictures there. Darn. After purchasing our tickets, we had some time to explore the Museum of Westward expansion. It’s a pretty fun museum, but there are creepy automaton people talking and telling their stories. The kids also did some fact finding to earn their junior ranger badges. We watched a film about the making of the arch, and it was FASCINATING! Did you know…. * The Gateway Arch is the tallest national monument in the United States at 630 feet. * Construction began February 12, 1963, and the last section of the Arch was put into place on October 28, 1965. * The Arch weighs 17,246 tons. Nine hundred tons of stainless steel was used to build the Arch, more than any other project in history. * The Arch was built at a cost of $13 million. *And did you know that not one worker lost his life in the making of this grand monument? And even more amazing is that people can GO UP to the TOP!! You travel up to the top in these little pods. Each pod can seat 5 people. The pods are constantly readjusting, because the ride is not straight up. It’s kind of like a ferris wheel. At the top you can actually walk around in the enclosure and take pictures or look out the little windows. If you lean WAY over, you can see the base of the arch. I did not lean way over. I could barely lean into the window. Yes, I’m squeemish. For me, it was not a pleasant or wonderful experience, but it was truly and AMAZING experience. I don’t like being up that high, nor do I like leaning way out to see the magnificent view, but, oh what a view. Here’s our whole group up there in the very top. When we came out of the monument building, it was POURING rain. No more pictures, sadly, as we dashed to the parking garage. There were so many more things to do in St. Louis, and at least one other really cool museums we had kind of planned on seeing, but the kids were MUSEUMED OUT. It was almost 3 pm, they were hungry and tired, and didn’t want to walk around and see any more STUFF. We decided to find a Steak n Shake. Yum. In fact, many would say it was the best meal of the trip. It turns out it was happy hour, so we got a few shakes (well, more than a few) to go with our yummy hamburgers. Heaven. Wish we had one of these in Utah. So, instead of exploring all that St. Louis had to offer or seeing one more fabulous museum, we went back to the hotel and the kids swam in the pool. They were quite happy with that decision. 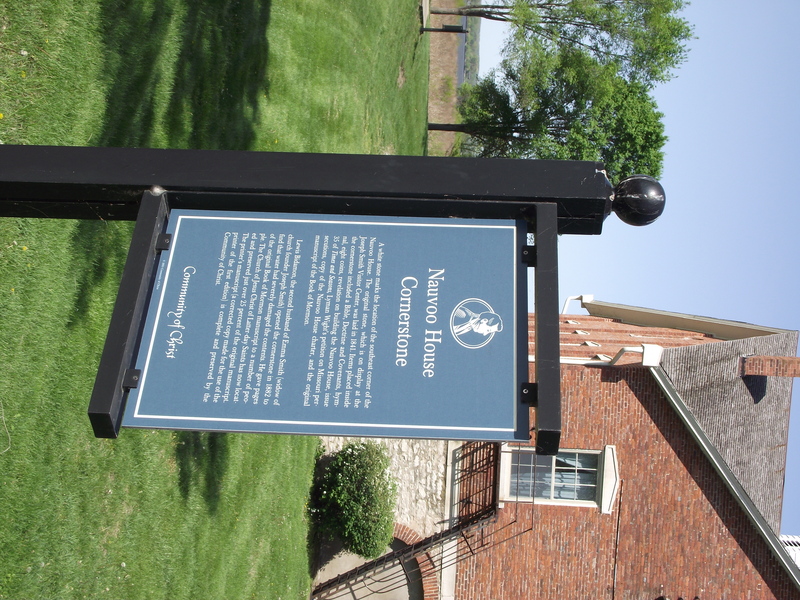 While in Nauvoo, we wanted to go see some of the sites that aren’t owned and operated by the LDS church, rather by the Community of Christ Church (formerly known as the Reorganized LDS church). 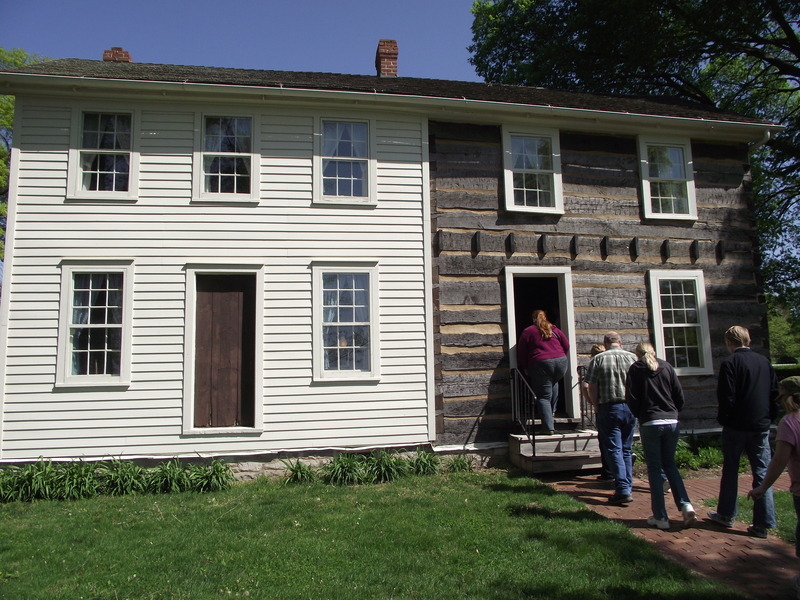 The tour began with a film about Joseph Smith and his time spent in Nauvoo. Quite different from the Mormon telling, they mention that at the age of 14 Joseph Smith went into a grove of trees and had a ‘religious experience’. 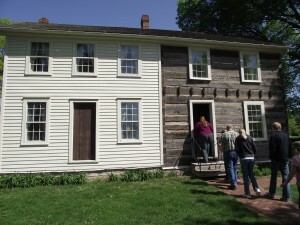 It was interesting to visit the homes of Joseph and Emma Smith, and hear more sides of their story. What I missed, though, was the testimony bearing. 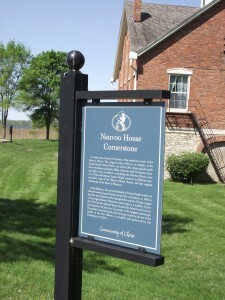 At most of the other sites in Nauvoo (the ones run by the LDS missionaries), they sprinkle their testimony in with the history. At these sites, the guide ended with a hint for monetary donations. But even without any bearing of testimonies on the tour, our testimonies inside are still bright. We know that Joseph Smith was a prophet of God, not just a religious and community leader. They wouldn’t allow us to take any pictures inside the houses, but there were many period pieces, some owned by Joseph and Emma. Many thanks to Cole, who figured out how to upload pictures even without the camera cord (and since the card was full, it was vital!) More posts and pictures later!